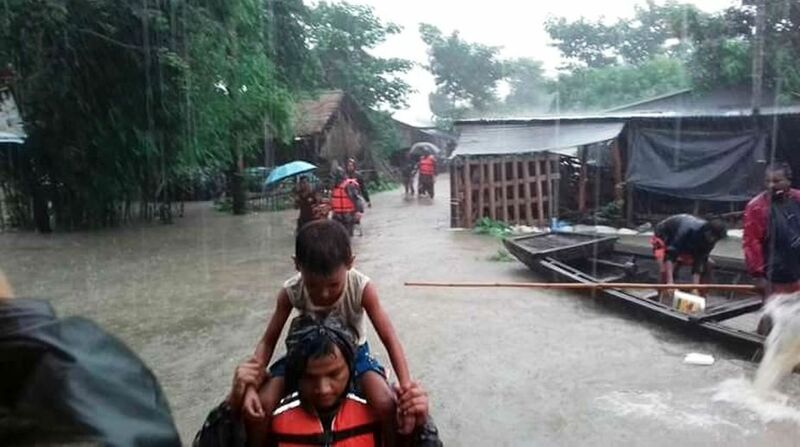 Rescuers evacuate residents from a flooded area in Bhadrapur, Nepal. Floods and landslides triggered by incessant rains have killed 40 persons in Nepal, the Ministry of Home Affairs said on Sunday. At least 36 persons have been reported missing in the low-lying areas, over 20 injured and thousands of families have been displaced since Friday, Xinhua news agency reported. In Rautahat district, 27-year-old Sharmila Yadav, in labour pain, and five of her family members died on Sunday morning while on way to hospital after the jeep they were travelling in was washed away in the floodwaters. Police said they recovered six bodies. The family was rushing towards the hospital at Rajpur in the India-bordering district after the pregnant woman complained of labour pain. The Home Ministry said Jhapa, Morang, Sunsari, Saptari, Rautahat, Sarlahi, Dang and Banke districts were the most affected by floods. Around 2,000 families have been trapped in floodwaters at Sakarpura, Banarjhula, Barsain, Tiluliya and Kusaha since Saturday morning, Kathmandu Post cited the ministry as saying. The water level in many rivers has crossed the danger mark and they have changed their course, with a threat to houses and livelihood. Security agencies, including Nepal Police, the army and Armed Police Force, have been mobilised in the southern Terai districts for the relief and rescue operations. Home Minister Janardan Sharma on Sunday inspected the flooded areas and directed the agencies concerned to expedite rescue efforts. Meanwhile, many highway bridges which serve as the lifeline of the nation have been damaged, obstructing vehicular movement for relief and rescue programmes. In many places, helicopters have failed to operate due to bad weather. The Meteorological Forecasting Division has forecast moderate to heavy rains to continue across the country for the next few days.